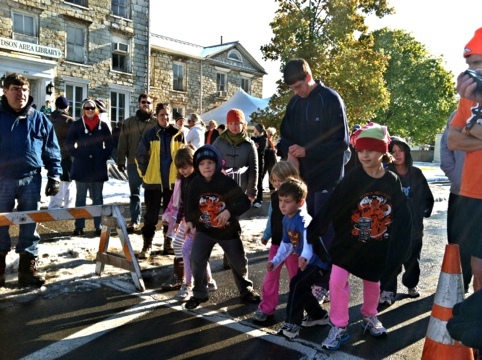 Despite an ominous Saturday evening marked by the threat of 12 inches of snow and a declared snow emergency, the 11th Annual Hudson Area Library Ghostly Gallop 5K Race/ Walk got off Sunday morning (10/30/11). I don’t know who won. I managed 41 minutes (much more than twice the winning time to be sure) and Karen came in at 52 minutes. The kids had their one mile race too.